Samuel Abel French (1845-1923) purchased 15 acres and 10 perches of land on Dayboro Road (Sub. 1 of Portion 38) on 8 April 1876. It is believed that his house was built a short time later by James Foreman, the pioneer farmer and carpenter who had settled in the area later occupied by the North Pine Country Park. Although Sam French farmed the land from the 1870s, and there are many references to ‘French’s Farm’ during this period, in 1889 he was also appointed by the Pine Divisional Board to oversee repairs to the North Pine River Bridge. On 30 March 1899, he was appointed Clerk of the Board, a position which he held until 31 March 1905. He also served as Secretary to the Agricultural, Horticultural and Industrial Association, the Show Society of North Pine, until March 1913. During 1934, the property was transferred to Samuel James Mole, the grandson of Sam’s second wife, Tamson Eliza Bunbury. 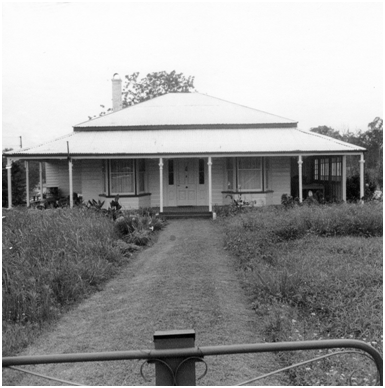 The Mole family still retain ownership of this very significant heritage building, which is undoubtedly the oldest residence surviving in the Petrie area.